I’ve noticed that I have a preference for shaving foam. As I’ve said before, when using shaving gel, you have to work it into a lather before applying onto the skin (insert obligatory aint nobody got time for dat quote) as opposed to shaving foam, you just apply it to your skin right away. That in and of itself can shave time (see what I did there?) off your shaving routine. Another perk of using shaving foam (any shaving foam really) is that you do not have to go over the same area twice, minimizing the chance of razor burn, ingrown hairs, and such. All in all, I feel like shaving foam is just easier to work with. The reason why I love Nivea’s For Men Shaving Foam specifically, is because after rinsing it off, my skin is soft, squeaky clean, and residual-free. I believe the main reason why this makes my skin feel the way it does is because this stuff is marketed as a shaving foam for men’s faces. I have a strong aversion to products that leave behind a thin film of some sort on the skin (bath and shower products marketed as “moisturizing” are guilty of that) but since this stuff is geared towards men, it’s not particularly moisturizing but it doesn’t dry out the skin either. Like I said, it makes my skin feel soft, squeaky clean, and residual-free (just the way I like it). 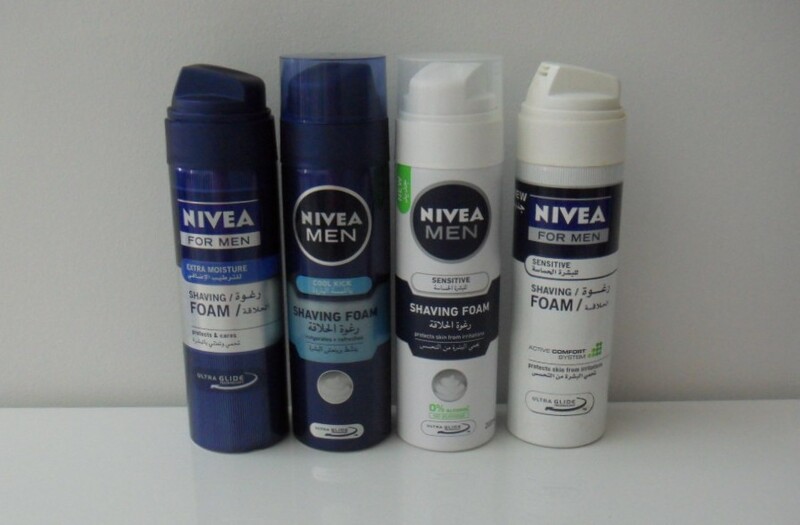 Nivea has a selection of 4 shaving foams (for men) that cater to different needs. I have 3 to show you here today. Cool Kick which is my favorite and the one I keep repurchasing time and time again, Extra Moisture which I accidentally purchased thinking it was Cool Kick (because they both come in a blue can), and Sensitive (white can). Cool Kick Shaving Foam Cooling formula with Mint Extracts, ISO-Magnesium and Vitamin Care for an extra invigorating freshness kick. Extra Moisture Shaving Foam Protects against shaving cuts and burns and keeps skin nourished with the care of vitamins and moisturisers. Sensitive Shaving Foam Enriched with Chamomile and Vitamin Care, the Sensitive Shaving Foam helps to protect and comfort easily irritated and sensitive skin while shaving. One of the reasons I love Cool Kick in particular, is because it scents my skin with it’s subtle yet unmistakably masculine scent. I’ve mentioned this before but I’ve developed a fondness for unisex if not downright masculine scents. The scent might not appeal to everyone but I enjoy it and I like the fact that it tends to linger on my skin. Sensitive is formulated with 0% alcohol and happens to be fragrance-free, meaning it doesn’t have that appealing masculine scent I enjoy so much. Another reason Cool Kick is my favorite is because it truly feels refreshing on my skin, thanks to the Mint Extracts. It’s nothing like the stinging/burning some people experience when using certain lip plumpers. The cooling sensation is much more subtle than that (but effective nonetheless) making Cool Kick a joy to use especially during Kuwait’s unforgiving summers. I’ll try out different products from time to time (just for the sake of trying them out) and sometimes forego shaving all-together in favor of sheera (wax) but I always return to Cool Kick. 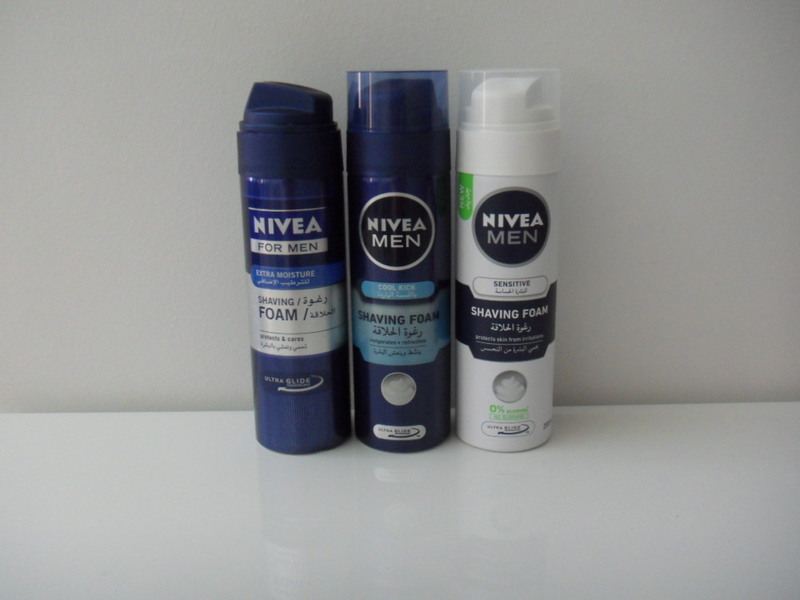 These budget-friendly shaving foams from Nivea are sold literally everywhere in the world. If you care to, they are also travel-friendly (even though they might not look it) so once you replace the cap, it won’t come off and destroy the contents of your suitcase. I’ve lost count of how many times I’ve repurchased it over the years (and will continue to do so) because it’s my favorite, by far. Have you tried shaving soaps? How do they compare in your eyes? Hi there! With Shaving Soap, you have to work it into a lather (either using your hands or a special brush) as opposed to Shaving Foam which you can just spray directly onto your skin. Additionally, with Shaving Foam, you can clearly see where you have gone over with the razor as opposed to Shaving Soap so you don’t have to go over the same area twice. As I’ve said before, that can minimize the chance of razorburn and whatnot. Shaving Foam is just overall easier to work with as it tends to stay put as opposed to Shaving Soap which drips down or disappears before you have a chance to reach the area that you’d like to shave. Hope this was helpful!